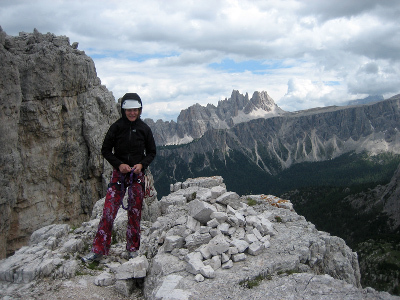 One of the most popular and accessible crags in the Dolomites is the Cinque Torri (~five towers). At the same time you find a great variation in grades and routes (faces, cracks, corners etc). 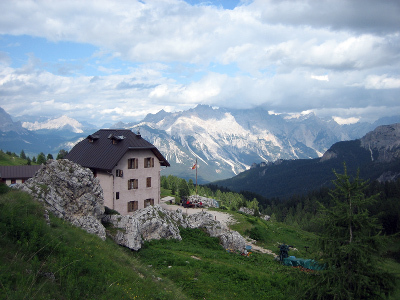 It is thus a great place to get introduced to the historic Dolomites and I have gone there to explore it with my girlfriend Elvira. 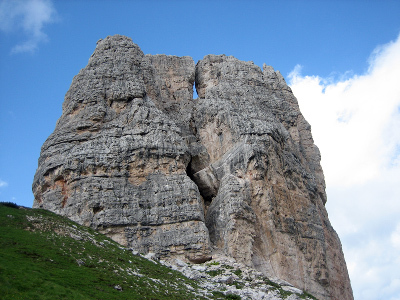 Cinque Torri (on the right half of the picture) - on of the most popular climbing crags of the Dolomites. There are two huts within ten minutes walk of the crag. We chose the Refugio Cinque Torri which can be reached by car (the other is easily reached by a lift). We do not have a reservation, but luckily they have room for us for a week, albeit we have to change room a couple of times. Great food and very nice owners - I can highly recommend the place. The Refugio Cinque Torri seen from the towers. Quite a spectacular view from the hut! 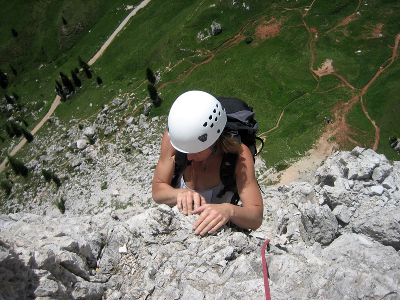 The Dolomites are famous for multi pitch routes on traditional gear - one of my favorite kinds of climbing :-) We start out with Via della Guide (IV) - the easiest multi pitch route on the Torre Grande, which is the tallest of the towers. Via della Guide (IV) is the easiest route to the summit of Torre Grande. Move the cursor over the picture to see the route (approximately!). The first pitch is the hardest (IV) followed by three easier pitches (II-III). The climbing is thus quite easy, but albeit the guide book claims that the rock is relatively solid we really don't like it. 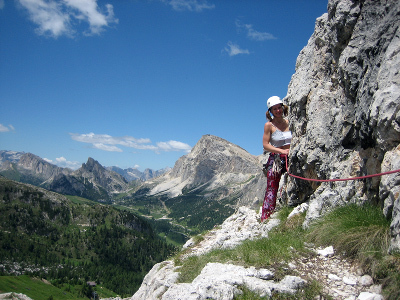 Elvira belaying the author while taking in the stunning view! As seen below, the rock was quite loose and I didn't like most of the protection either (albeit some old cemented pegs looked alright). Elvira making the last moves to the summit. However, the view and positions were fantastic and we thus continued to climb in the area - albeit well within our max limits regarding the grades. None of us wanted to test our pro in the poor rock! it is thus a good idea to bring warm clothes on the longer routes!